After the Pueblo Revolt of 1680 AD, some Shoshone people in Wyoming bought horses. These horse-riders split off from the other Shoshone and became the Comanche. At that point, Shoshone history becomes separate from Comanche history. 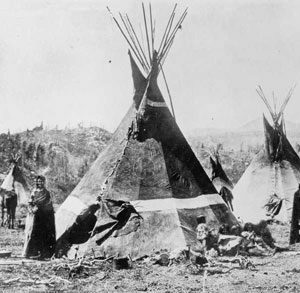 The rest of the Shoshone still didn’t have horses, even though by about 1750, Shoshone people were trading with the Mandan to their east. The Shoshone sold bison skins and beaver furs to the Mandan, in exchange for guns, glass beads, iron tools, and cloth that the Mandan bought from French and Spanish traders sent out by Louis XV. Probably Shoshone people occasionally met white men who were fur trappers or traders. Like the Mandan to their east and the Nez Perce to their west, they caught smallpox and measles from their neighbors and the traders, and many of them died. In 1805, Lewis and Clark formed the first official visit of the United States government to the Shoshone people. Because Lewis and Clark brought with them a Shoshone interpreter, Sacagawea, and in the hope of getting some horses, the Shoshone welcomed them warmly. By 1860, however, as the railroad brought more and more white settlers into Montana and Idaho, the Shoshone realized their mistake and began to fight the settlers. In 1863, the United States Army took revenge by killing about 400 Shoshone – including many young boys and girls – in the Bear River Massacre. The Shoshone kept right on fighting wars with the United States until 1879. They were the last Native Americans to be fighting the United States in the Pacific Northwest. Even as late as 1911, a small group of Shoshone and Bannock people killed four ranchers in Nevada. What are the Shoshone doing today? The numbers of Shoshone people have been increasing since the end of the smallpox epidemics. Today there are about 12,000 Shoshone people. Most of them live on Shoshone reservations in their traditional home. Cite this page: Carr, K.E. The Shoshone fight the United States. Quatr.us Study Guides, August 14, 2017. Web. April 22, 2019.